He was half-a-world away, interning on a bone marrow transplant ward at the Glasgow Royal Infirmary. There he witnessed young adults in the very prime of life struggling with the ruthlessness of often-fatal blood cancers and the vicious side effects of treatment. But the intern also saw the doctors’ compassion, patients resolve and the clear need for better therapies. So he dedicated his life to fighting blood cancers. Now, 25 years later, Dr. Stewart is a renowned multiple myeloma researcher and sequencing a person’s entire set of more than 20,000 genes — known as the genome — takes only a day or two. Dr. Stewart brings his passion to his new role as the Carlson and Nelson Endowed Director of the Center for Individualized Medicine, Mayo Clinic’s foremost effort to translate the promise of genomic sequencing into daily patient care. He succeeds acting director Richard Weinshilboum, M.D., and past director Gianrico Farrugia, M.D., who became CEO of Mayo Clinic in Florida on January 1. “The center has undergone a phenomenal period of growth and infrastructure building,” Dr. Stewart says. “The next phase of this exciting mission will be to drive what we have built into the clinical practice of all of our physicians. 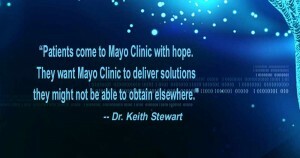 I'd love it if each and every Mayo Clinic patient could benefit from some form of individualized medicine in the next decade, no matter what stage of life they're at; whether they are well and want to stay that way, or sick and need our help. Dr. Stewart believes that with the price of sequencing dropping every year, it’s inevitable that one day everybody will have their genome sequenced routinely. 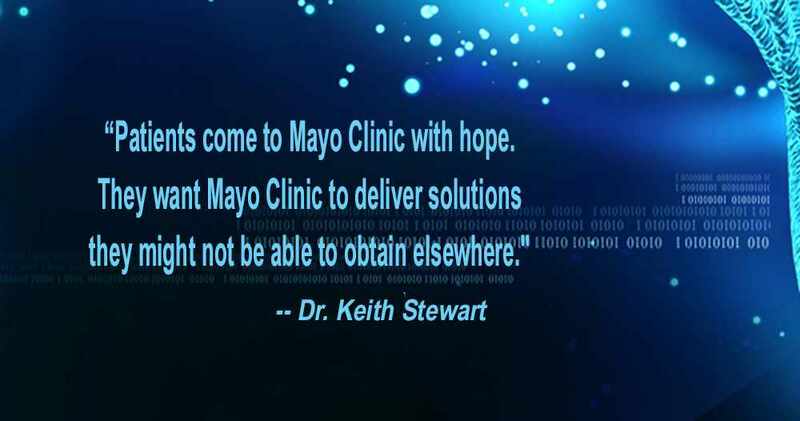 However, before that happens, it’s his mission to make sure Mayo Clinic leads this rapidly evolving field to understand all the things the genome is telling us. Dr. Stewart, the Vasek and Anna Maria Polak Professor of Cancer Research, uses as an example, his work with thalidomide, a notorious drug originally used for insomnia and morning sickness that was marketed to pregnant women in the late 1950s and early ’60s. Soon the public discovered the drug caused terrible birth defects and it was taken off the market. Dr. Stewart wrote about thalidomide in Science Magazine last year — "The 55-year history of the drug thalidomide is Shakespearean in scope, awash in unintended consequences, tragedy, resilience, driven characters, and redemption ... Less well known has been the resurgence in its use as a therapy to treat hematologic malignancy." Years after thalidomide was taken off the market, doctors including Dr. Stewart, discovered it was effective for treating certain blood cancers, though they had no idea why. But once researchers had the power to see how the drug interacts with our genomes, it all became clear. Based on the new genetic understanding of the response, Dr. Stewart and colleagues around the world studied a modern thalidomide derivative called lenalidomide. They paired it with two other well-known cancer fighting agents to treat 800 people with multiple myeloma. Nearly nine out of 10 patients responded to the treatment, which trumped a different regimen considered the standard of care. "In just the past couple of years, we've contributed here at Mayo Clinic to understanding why these drugs work using genomic techniques,” Dr. Stewart says. “Mayo is now developing a test that we can use to determine whether you'll respond to these drugs. Now that’s individualized medicine." 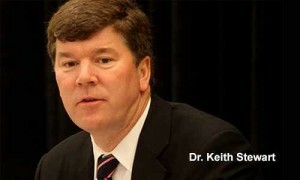 Thirty years ago when Dr. Stewart was an intern, survival in multiple myeloma averaged three years. Today survival has tripled and more and more patients are being cured without the side effects of older chemotherapy. Dr. Stewart is confident that by using the genome to individualize treatments, match the right drugs to the right patient at the right time and discover new chinks in cancer’s armor, that the unmet needs and unnecessary suffering of many cancer patients will begin to be no more than a bad memory.